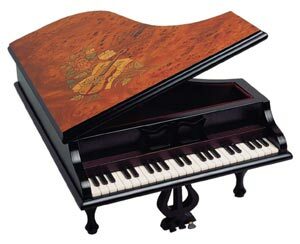 This miniature wooden grand piano from Jobin Music is beautifully made and has a clockwork musical movement fitted inside. It is wound from underneath. Lift the lid and prop open the piano top to hear the music play. There is a small storage area inside the piano. 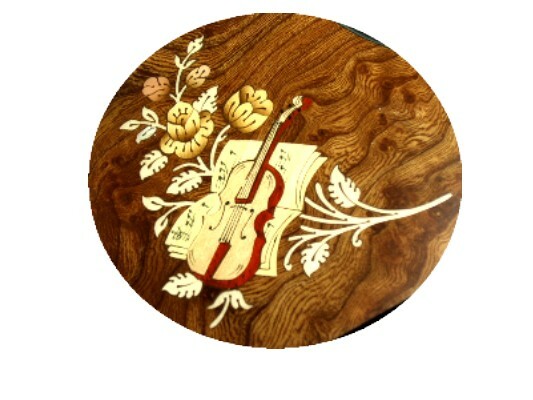 The inlay is of a violin,flower and music manuscript. The perfect gift for the piano player or classical music lover. Approx Size : 17.5 x 14 x 9.5 cm. PLEASE NOTE: This piano miniature is NOT a real instrument. It is only an ornament fitted with a music box movement.